MANILA, Philippines — It seems almost a little unfair that Sisi Rondina and Eya Laure can only play together for one season, instead of three. Laure, the most highly touted University of Santo Tomas (UST) recruit in at least half a decade, will make her long-awaited collegiate debut in Season 81 — just in time for Rondina's farewell campaign. The youngster had to wait two more years before playing in the seniors division, thanks to the implementation of the K-12 program. When asked about it, Laure just shrugs. She has long since reconciled herself with the situation. Getting frustrated about her long wait, she said, does nothing for her. "Eh kung i-frustrate ko pa ang sarili ko, parang hindi naman siya makakatulong sa akin. Nakaka-frustrate na two years ako naghintay, pero okay naman, worth it naman 'to, masaya naman sa team," she insists. "Frustration, tinatanggal ko siya talaga. And basta, doon lang ako sa brighter side, na baka kaya ako pinahintay pa ng dalawa para pagdating ko sa college, ready na talaga ako," she adds. It can be argued that Laure was ready for college two years ago. Much has been said about the incoming UST rookie — a prodigious volleyball talent who can play multiple positions, from opener to utility to setter. 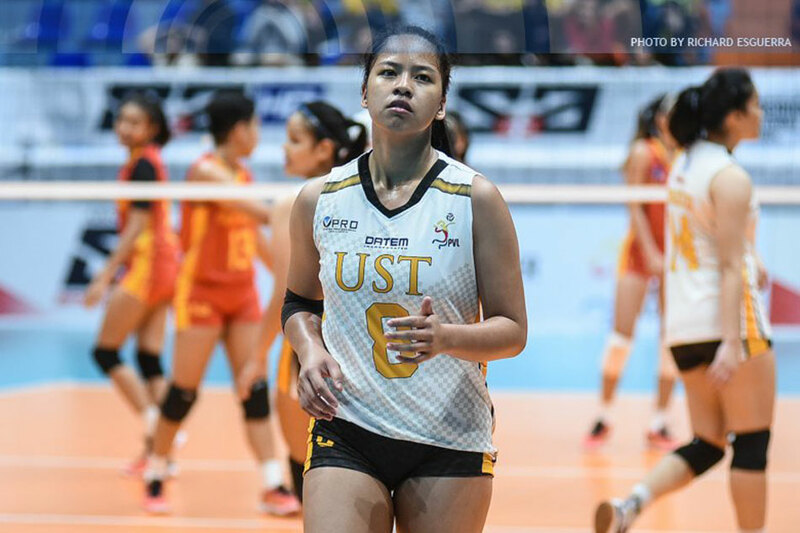 Years before she was supposed to play in the seniors division, Laure served as a guest player for UST in the V-League, and showed she can more than keep up with the college players — she can outshine them. Thus it is not surprising that the UST faithful waited with baited breath until it was absolutely, utterly certain that Laure was enrolled in the university, that she was headed to the seniors division, that she would wear the black and gold, and that she would take on the mantle of UST's No. 8. Perhaps they should not have worried at all. 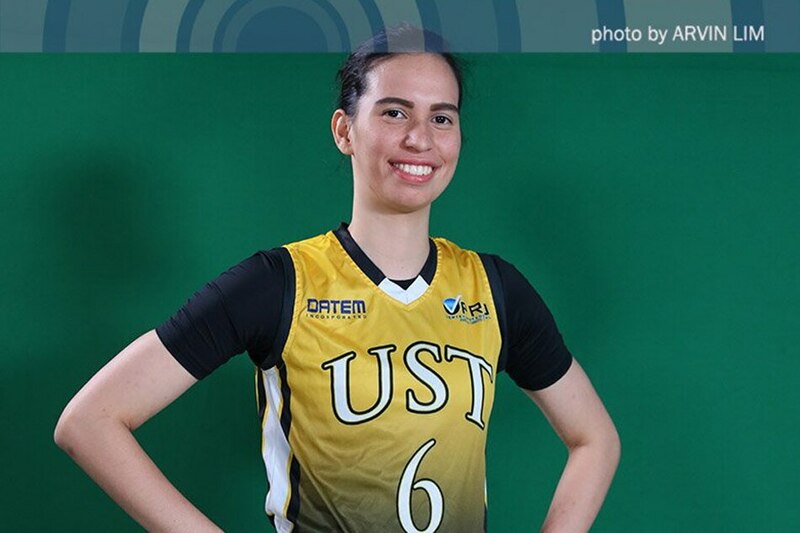 Laure was highly recruited, yes, but her heart was always set on UST. "Sobrang happy, kasi for how many years, mare-represent ko na ulit ang UST, at sa college level naman. Hindi naman sa high school level," she beams. It's disappointing, of course, that her older sister EJ won't get to play with her in Season 81, as she is still working her way back to full fitness after missing all of Season 80 due to a shoulder injury. EJ, the co-Rookie of the Year in Season 77, will still have two years of eligibility left — a prospect that brightens the younger Laure's perspective. "May dagdag siyang two years. Ganoon na lang," said Laure. "Ako kasi, hindi ko na ini-stress ang sarili ko, 'yung mga bagay na hindi ko naman kontrolado, and 'yung mga bagay na hindi naman makakatulong sa akin." "Ayun, tinitingnan ko na lang, si Ate Tin (Francisco) and si Ate EJ, magsasabay sila for two more years. Doon na lang ako sa, in fairness, 'pag second year at third year ko, kahit papaano naka-adjust na ako sa time na 'yun sa college level. Kahit papaano, makakatulong," she added. The only downside for Laure is she gets to spend just one year with "Ate Sisi," UST's ferocious veteran open spiker, who enters Season 81 with the weight of España on her slim shoulders. Rondina has never been one to shy away from expressing her emotions inside the court. Be it excitement and happiness, or frustration and anger — Rondina bares everything on the court, and her fans adore her for it. It shouldn't be surprising that Rondina channeled those emotions when asked about her final year in the UAAP — a time that came all too fast for the Cebu native. "I feel… you know, end of the world," she said, before quickly adding: "Charot." She sighed, then continued: "Feeling ko parang, napaka-dramatic ng ano. Siyempre, dati lang para lang akong totoy na naglalaro sa UAAP pero ngayon, patapos na. Wala eh, parang buhay eh, may katapusan." Rondina entered the UAAP the same season as EJ Laure, but with a fraction of the fanfare. As a rookie, she towed UST to the Season 77 beach volleyball title, but was mostly used as a reserve during the indoor season. Yet her limited playing time only made her a fan favorite — the UST gallery looked forward to her substitution, knowing that she would inevitably provide a boost of energy for the Golden Tigresses. By her third season, Rondina had firmly claimed a spot in the starting six. By her fourth year, with EJ Laure sitting out due to her shoulder injury, Rondina took ownership of the team. While rookie Milena Alessandrini adjusted to the pace of the UAAP, Rondina carried UST's offense. Her slim frame and height — at 5-foot-6 Rondina is a head shorter than most UAAP open spikers — were no impediment, and opposing teams rarely had an answer for her vertical leap and her tenacity. She finished the season as the UAAP's Best Scorer, totaling 296 points. But UST managed just four wins in 14 games, and missed the Final 4. Season 81 figures to be different, however. For one, Rondina won't have to be a one-woman wrecking crew this time around. It took her some time, but Alessandrini appears to have figured out the pace of the UAAP game, and grew in confidence over the offseason. Veteran Dimdim Pacres is expected to be a more consistent force this time around, after stints with club teams over the past year. And Laure, of course, should make an immediate impact. Rondina is hesitant to brand her team as a contender immediately, even as expectations for the Golden Tigresses are higher than they've ever been during her five-year stay. "Grabe naman," she said when told that her team is seen as a surefire Final 4 pick. "Pero, we'll work for that." "Siyempre, trabaho. Kailangan naming double-time. Kasi nga, last season, medyo tagilid. So, kailangan naming maituwid ngayong season na ito, lalo na, aalis na ako," she says. 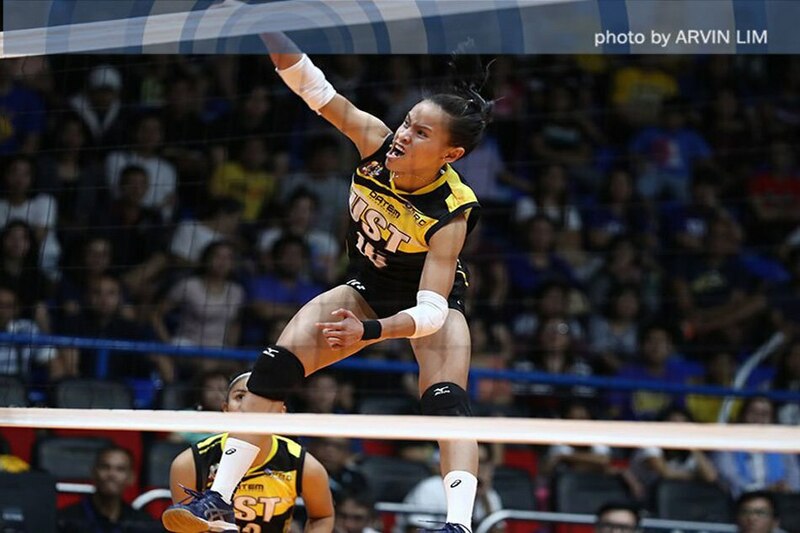 Don't mistake her hesitance for distrust: Rondina has full confidence in her teammates, and in herself. "I always believe talaga," she said. "I always think talaga na we'll win, if we want." For her, it's not so much about their self-belief — it's about the work they need to put in. For Rondina, it is always about the work they need to put in. "Hindi makukuha nga 'yan kung hindi namin pagta-trabahuhan. I trust their abilities, talaga. Kailangan lang talaga na sama-sama kaming pumunta sa giyera na lalaban," she says. In Season 79, Rondina and Laure were a lethal, if not always consistent, 1-2 punch for UST. They made it to the Final 4 as the third seed, but lost to eventual champions De La Salle University in an entertaining semis match that lasted four sets. In Season 81, her last in the UAAP, Rondina is teaming up with another Laure to form a new 1-2 punch for UST — one that will hopefully bring the Tigresses to even greater heights. Like many UST fans and volleyball pundits, Rondina has high expectations for the younger Laure. "Si Eya, parang nagawa na siya eh," she said. "Sabihin natin na rookie siya, pero siya 'yung rookie na ginawa na. May alam na," she explained. "Siyempre, marami ding experience ang bata. So, nagpapasalamat ako na may pumasok na ganoon sa amin." It will be an interesting dynamic to watch. Both Rondina and Laure are known for their loud personalities and competitive fire, and how they mesh inside the court will be crucial to UST's campaign. Fortunately, they are already building up a strong relationship outside of it. Laure said Rondina was her "buddy" during their training camps in Baguio and Thailand, and even when they competed in the University Games in Dumaguete. They have conversations about what they need to get done this season, and Laure is always eager to learn from the veteran. "Meron nga kaming same values, na competitive, na palaban," said Laure. "Si Ate Sisi, ang maganda naman sa kanya, nagpasasabihan mo siya," she added. "Hindi naman siya 'yung parang leader na porke't magaling ka, hindi ka mapagsasabihan kasi masyado kang naniniwala sa sarili mo na magaling ka. Si Ate Sisi 'yung type na pinagsabihan mo siya, ia-adopt niya 'yung sinabi mo." That Rondina is willing to see things from other people's perspectives gives Laure confidence that they will work out just fine inside the court. "Nakakagaan sa isang team na may ganoon kang leader na hindi siya closed minded na para lang sa sarili niya," she said. And for Rondina, what matters at the end of the day is that they get the job done for UST — especially as this is her last chance to do so. "Magandang exit," she said wistfully of her goal for this season. "Pero kailangan talaga namin mag-trabaho ngayon, para makuha namin 'yun."